Something is getting at my squash plants. Any idea what it is and how to control it? Is it possible that it is Leaf Miner which is also going after my beets? I just got some BT today and have applied it to the beets and also the squash plants. Maybe I've already done the proper handling. Are there white flies on the underside of the leaves? No white flies on the underside of the squash leaves. Mazzy, click the link above and read the thread I posted for more info. I read the post and incorporated links. I suppose it is possible that a strong change in weather might be the culprit. The temperature dropped avg of 20 degrees with pretty high winds. If it is a nutritional problem unlikely phosphorus because roots are huge and abundant. No stunted growth so unlikely nitrogen. The burned leaf edges looks like potassium. I've got the cooperative extension phone numbers. I'll see if I can email pictures to the Master Gardener. Their office is about 20 miles away so if something is going around then they will likely have seen it. Thank you for contacting the Master Gardener help desk about your cucumbers. Between the photos you sent and our phone conversation, the affected leaves are the lower, older ones, and the newer leaves all look OK. The dead outside margins are probably from not having enough water, possibly during our last heat wave. Cucumbers are sensitive to high heat, and while El Sobrante is not in the warmest part of Contra Costa, you still get warm enough to stress cucumbers. If you are expecting a really hot spell (90 degrees or warmer), you might want to erect something to shade the cucumbers during the hottest part of the afternoon. You should also make sure the cucumber plants have enough water. Cucumbers require 1" to 2" of water each week. 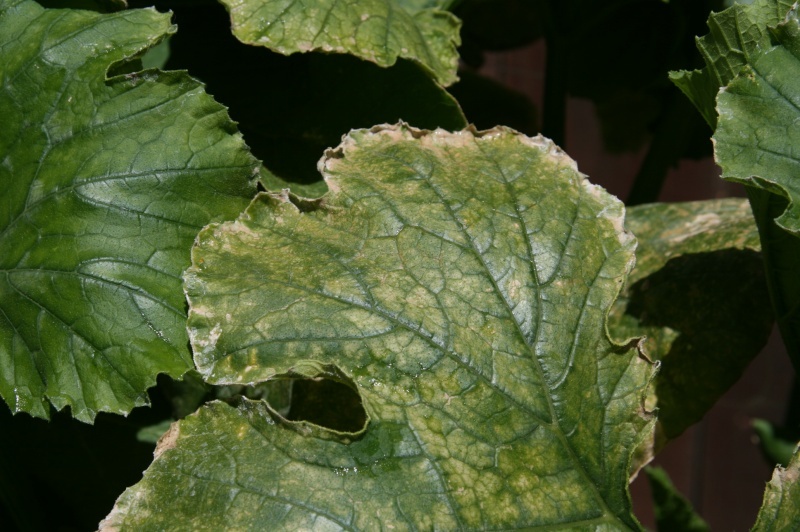 In the second photo, the leaf appears to have downy mildew which is common in cucumbers. It appears first as small, pale green to yellow, angular spots that give the foliage a mottled appearance. Eventually the spots merge and the leaf will turn brown. Older leaves become infected first. Spores of the downy mildew fungus are carried by air currents or by rain-splash or sprinklers--a wet leaf surface is required for infection. Spacing plants to reduce canopy density and humidity will reduce its spread, but that is antithetical to the square-foot garden method, isn't it? It's possible that because you water every day the humidity stays high enough to encourage downy mildew. This may abate as we get into the drier months ahead. I hope this information helps. Please let us know if you have more questions. Happy gardening! The attached pictures are of cumber plant leaves. 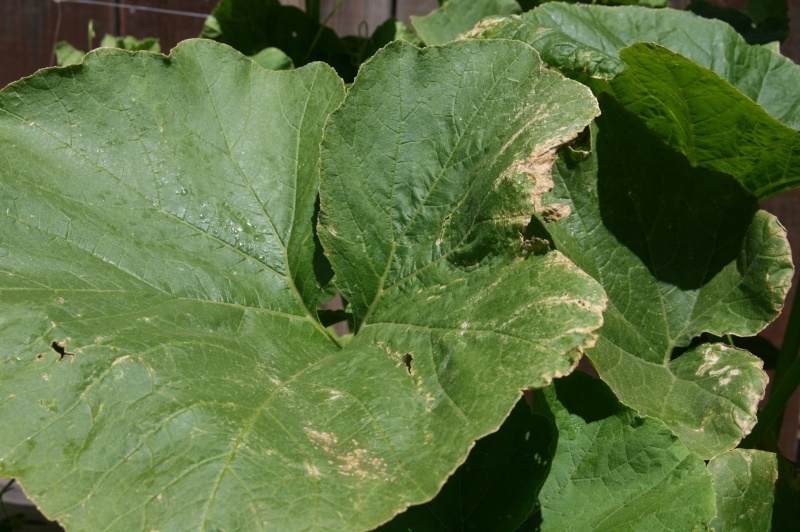 The defect is spreading to nearby squash plants. In another part of the garden my beet leaves got attacked by leaf miners. I used Thuricide BT http://store.doyourownpestcontrol.com/thuricide-bacillus-thuringiensis-bt-concentrate-caterpillars?gclid=CjkKEQjw8YSdBRChhPXJvPvMztABEiQAkn893sq5CNTXFbz68mNPo8EENoxWAJUoP01smIVcE-5S3Y7w_wcB on it and have trimmed off the bad leaves. I also tried BT and Neem Oil on the Cucumber leaves. See attached pictures of the Cucumber leaves. I only applied it recently so probably not enough time to correct the situation. Do you recognize this plant infection? Let me know your thoughts and suggested handlings.